Dedicated to education and research on the human connection to animals and the natural world, The Sam and Myra Ross Institute at Green Chimneys serves as a model and training site for the varied facets of human-animal and nature-based interactions, grounded in evidence-based practices for implementing diverse and ethically responsible educational and therapeutic interventions and activities. The Sam and Myra Ross Institute offers a meaningful introduction to the theoretical and practical principles of incorporating animals, plants and the natural world in the re-education, socialization and treatment of deeply impacted children who have experienced crisis and a lack of success in their lives. The Sam and Myra Ross Institute was established to deepen the legacy, vision and impact of its animal and nature-based programs by demonstrating how purposeful contact with animals and the outdoors can enhance formal therapies and traditional education, and sharing knowledge to bring continued growth and leadership to the field. The Sam and Myra Ross Institute is inspired by the remarkable work and lifelong commitment of Green Chimneys Founders Sam and Myra Ross. Meet The Institute's Director, Michael Kaufmann. 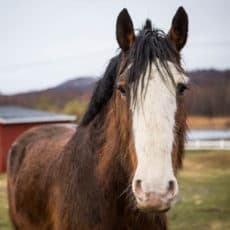 The Sam and Myra Ross Institute at Green Chimneys strives to bring together, and serve, those working in the field of human-animal interaction.